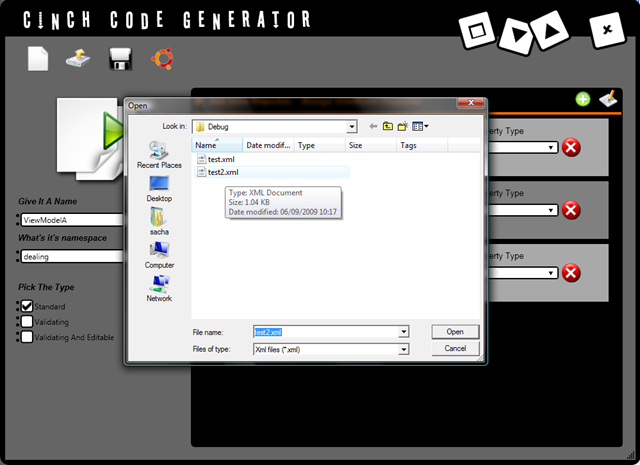 The source code is available as part of the main Cinch download, which I realise is a big download now, but I wanted to keep it all together so it was easy to keep code generator Cinch.dll reference synced. Enjoy, I am off for a holiday now, so I will not be answering any questions for quite some time, sorry about that. 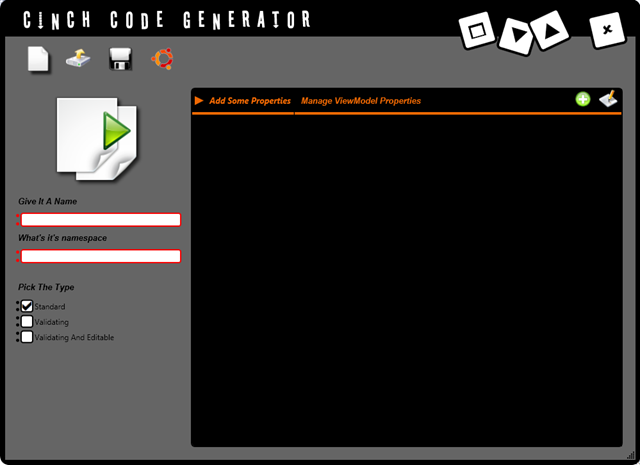 As some of you may know I have been working on a code generator for my Cinch MVVM framework, which I am pleased to say I am nearly done with. The last stumbling block has been that I need to extract a bunch of Namespaces from Assemblies that the main code referenced, which I want to do by the use of Reflection which is very easy. But I also wanted the Assemblies that I would need to examine loaded into a new AppDomain so that I could Unload the newly created AppDomain when I had finished Reflecting out the Namespaces from the Assemblies. /// List. The new AppDomain is then Unloaded. I think this code is pretty useful and I hope you find as much use for it as I have. It took me long enough to figure this out, and many google searches were done and much consulting of APIs/picking friends knowledge was done to bring you this code, so enjoy it. It nearly killed me getting that one to work. A while ago I released my Cinch MVVM Library out there into the wild, and the reception it was got has been pretty good, so I thank you all for that. When I wrote Cinch, I was aware that there was a bit of code that I was still asking people to write, al be it they would gain a lot too, such as support for ViewModel controlled data editability/editable object support etc etc. But there was still a bit of code that users had to write on their own, even if once they inherited from the correct Cinch base class ViewModel (there are 3 choices for that by the way). 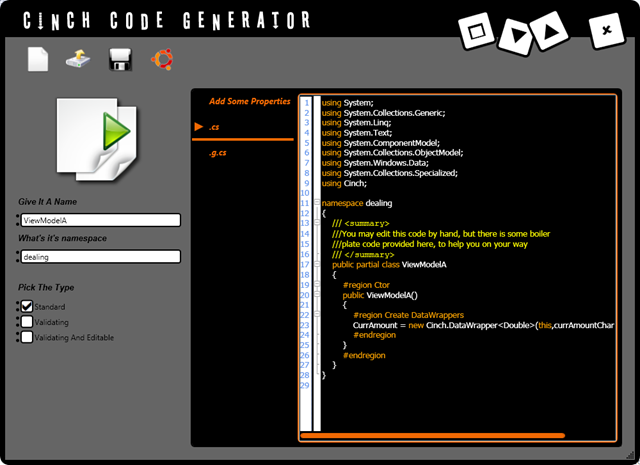 So I thought how easy it would be to create a code generator to simplify this process. I am pleased to say I am practically done with this and it should be available from the main Cinch site (which has had the source code moved to codeplex for obvious reasons) within a week. To create a ViewModel all you will need to do is pick your base class, and then pick some properties. Where if the property type you want isn’t present, just go and add it, and it will then be saved and will then become available now and in future. You can save a ViewModel configuration, so you can come back and re-edit or modify the code that will get generated. 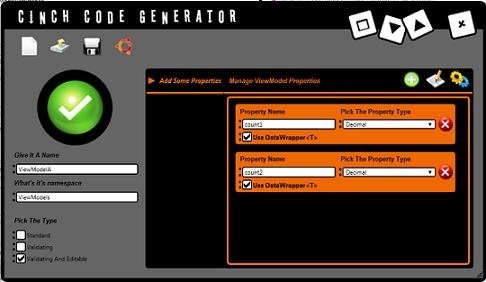 This part is clever, the Cinch Code Generator, will actually attempt to compile your code, and providing all the Types you used are available in the assumed standard Assemblies, It will give you a green or red light. A red light may occur as you picked a property type that is not known about, that may be a custom business object class that you plan to add later. 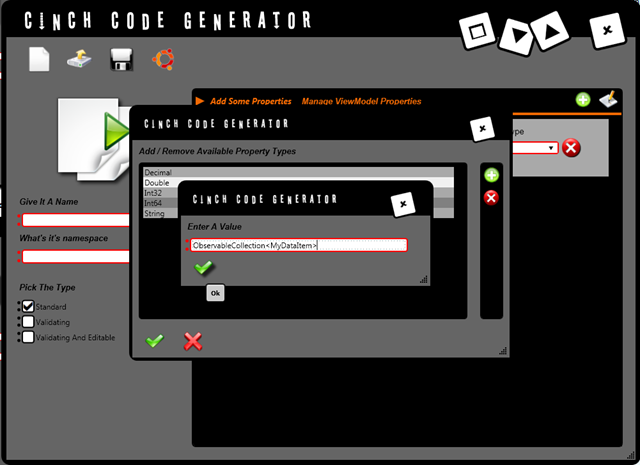 You could fix this to be part of the expected assemblies by editing the Cinch Code generator code. If I have time I may add this feature. Anyway shown below is a red light that comes out of the compile process, but you WILL always be able to override this and choose to generate the final code anyway. It’s YOUR choice. If everything goes fine, 2 new tabs are shown with the generated code, I decided to split this over a g.cs which is a totally generated code file and should never be hand edited and a .cs file which you can edit. 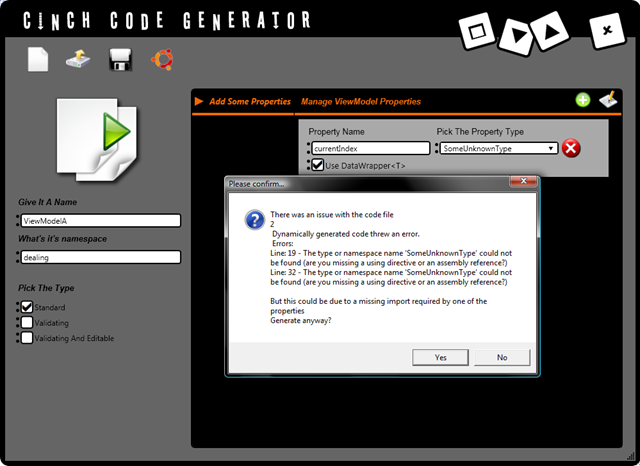 However if you run the Cinch code generator and copy the files it produces, you should be careful not to overwrite your custom part, that would be bad. So there you go that’ a taster of what’s coming. Hope you like it. It is not far off believe me, 1 – 2 weeks tops. 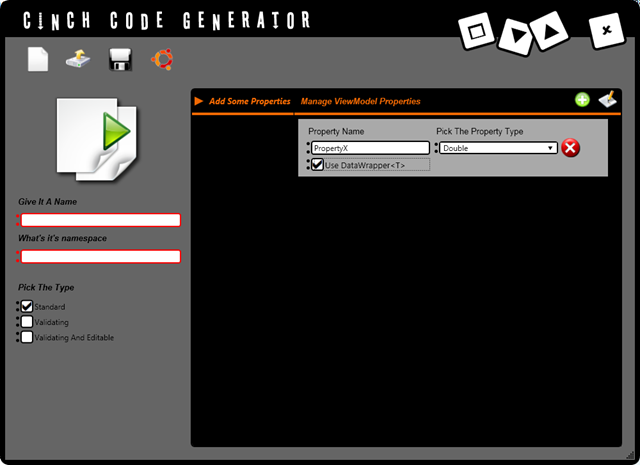 The other day I was at work and needed to use a WPF ListView (Selector) to call a ICommand in a ViewModel. Now we want to be good and use nice design approaches, so I thought about using the attached command capabilities of my Cinch MVVM framework. But then I thought ah I only want to call the ICommand when the user actually double clicks an Item in the ListView (Selector) and not when the double click anywhere else, like say a header, which the ListView certainly has. 32:          /// Gets the HandleDoubleClick property. 40:          /// Sets the HandleDoubleClick property. 92:          /// Gets the TheCommandToRun property. 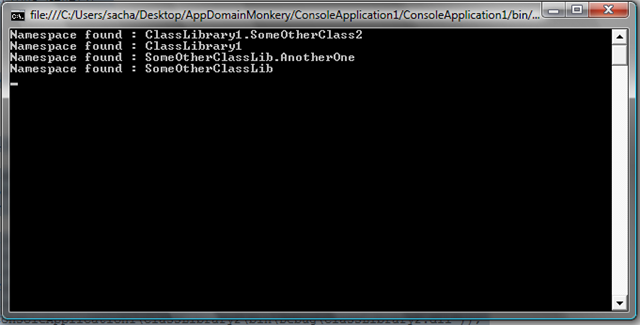 100:          /// Sets the TheCommandToRun property. 142:              // found a container, now find the item. 54:          /// This is a strong reference to the Command. 55:          /// CanExecuteChanged event handler. 59:          /// handler will be gc'ed. 84:              // Command.CanExecuteChanged event handler. 87:              // reference then the event handler will be gc'ed. 169:          /// action is enabled/disabled. 184:          /// (Target) IsEnabled property. 267:              // found a container, now find the item.